My mom told me once that my paati(grand mother) used to make rasam out of this pea eggplant /thuthuvalai but I never had a chance to have it.After many years I learnt this traditional rasam recipe from one of my lovely neighbor friend and got it done! !from time to time I make it “realizing” its natural goodness . Iam not posting pea eggplant rasam /thuthuvalai rasam recipe now!! the idea of making pea eggplant/thuthuvalai dosa recipe came from one of my favorite Revathi Shanmugam’s cook book!Her cooking method’s “always has and have been” a mental stimulation. It’s little tricky job cleaning the herb,should be very careful when cleaning because not only the stems have thorns it is there even in leaves.I prefer to clean it with help of scissors holding the thorn-less stem area with one hand.Its not like fermenting normal idli dosa batter(it’s totally different)it will have its own characteristic! !but can be enjoyed with any spicy chutney’s of your choice,I prefer spicy coconut chutney the best..
1.Sort out thuthuvalai leaves alone and wash it to make one cup. 2.Soak Gram dhal,toor dhal and both rice for three to four hours. 3.Then grind it along with thuthuvalai and red chillies to a smooth batter by adding salt at the end. 4.Leave it to ferment for 4-6 hours and then make it to a batter,so that you can pour it as thick dosa’s. 5.Now heat dosa tava spread the batter when it forms bubbles add little oil, bring it to medium flame close with a lid and cook till done. 6.Serve with spicy chutney’s preferably coconut chutney. Sort out thuthuvalai leaves alone and wash it to make one cup. Soak Gram dhal,toor dhal and both rice for three to four hours. Then grind it along with thuthuvalai and red chillies to a smooth batter by adding salt at the end. Leave it to ferment for 4-6 hours and then make it to a batter,so that you can pour it as thick dosa's. Now heat dosa tava spread the batter when it forms bubbles add little oil, bring it to medium flame close with a lid and cook till done. Serve with spicy chutney's preferably coconut chutney. Its not like fermenting normal idli dosa batter ,it will have its own characteristic! !but can be enjoyed with any spicy chutney. Can add more chillies according to your own spice level. Even green chillies can be added instead of red chillies. Bring the batter to the consistency that you can pour as a dosa. I prefer to clean it with help of scissors holding the thorn-less stem area with one hand. thank you for introducing us to this thuthuvalai keerai recipe and its benefits to us Vani. With all its benefits and your explanation as to how to clean it – very helpful. Beautiful pictures again:) If I do come across this keerai – I will surely try this recipe! This is very innovative, extremely creative adding such exciting variations with local herbs. As you rightly put in the very beginning just like your favourite author says these recipes are food for our mind too. Although I have never come across this leaf I shall now try to find out and as always your superior pictorial description has got me wanting to try this dish. A double thumbs up from me. Considering health benefits, this recipe scores very high. You have shared excellent presentation and narration of this recipe. I would be very grateful if you can provide me Hindi or Marathi name of these pea egg plant leaves. Another thing how to taste which leaves to pick for. Are they sour in taste like methi (fengrueek leaves) or tangy in taste like sorrel leaves. In southern parts of India it is found in abundance and the usability is only with leaves not the stem(in cooking). Even the leaves have small thorns.Slightly bitter in taste but it causes irritation to throat when swallowed raw!should be cooked before having it. 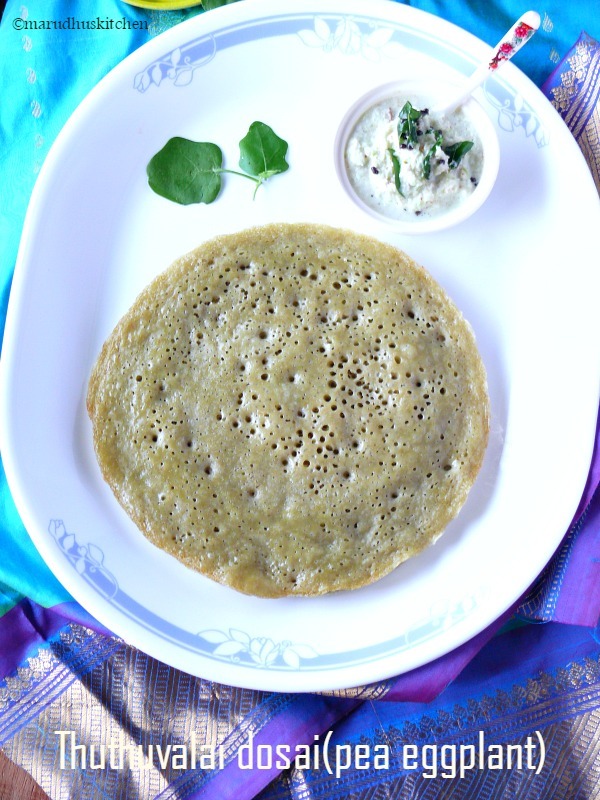 Very delicious and healthy Dosai recipe. I would want to know the hindi name for the Pea Eggplant leaves so that I can search for them in the Indian store.. Great Job Vani..
Never heard of Pea Eggplant and googled it just now.. Dosas looks absolutely delicious. Love the look of that coconut chutney too. Wow….that’s a healthy and nutritious dosa, missing such healthy greens here…dosa looks so soft and yummy! Inviting pics there!! yummy thuthuvalai dosai!! love it!! healthy too.. 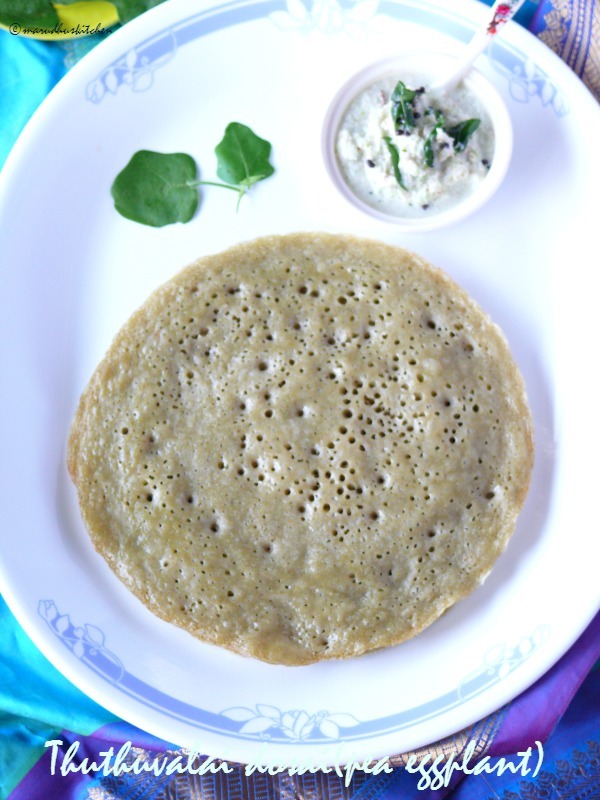 Healthy dosai.dosa looks soft and yummy. I had never heard of thuthuvalai keerai before this. With all those health benefits, I would love to get my hand on them. Dosas look soft and spongy..